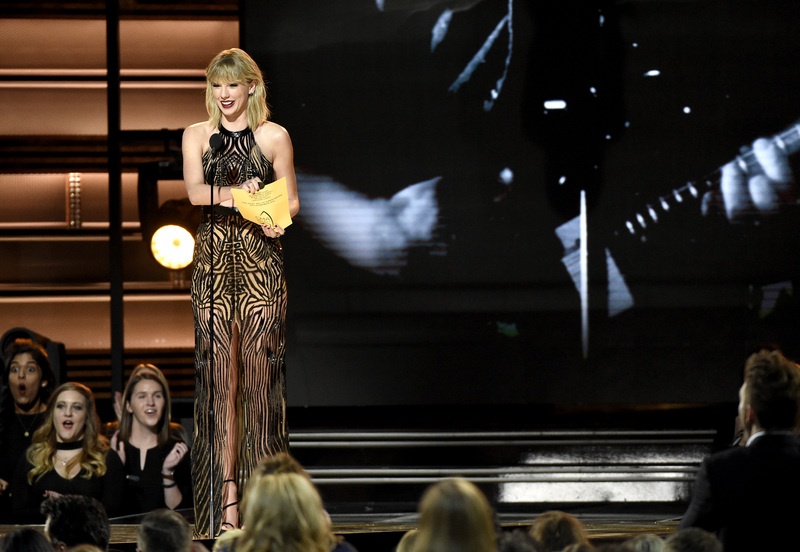 If you're a big fan of catchy, female-led pop music, you might be asking yourself whether Taylor Swift can get a 2017 Grammy. Great question, Taylor Swift fans. The answer is a little complicated. Firstly, you should know that, to be nominated for the 2017 Grammys, all songs and albums must have been released between October 1, 2015 and September 30, 2016. She hasn’t released a full-length album since her 2014 effort, 1989, which rules her out on the album front. But she has released one song this year: "New Romantics." Whether this song is eligible to win a Grammy is a little unclear. According to the Grammys, "Recordings must be available for sale from any date within the eligibility period through at least the date of the current year’s voting deadline (final ballot)." Since "New Romantics" was available for purchase individually via Apple Music as part of Swift's album 1989 before October 1 2015, this could rule the song out from being eligible to compete. However, this track was only released as a single in 2016. Presumably this means that whether or not Swift will be nominated will be down to an interpretation of this line. This is supported by another official Grammys' guide to the awards, which states that the Song of the Year "must be either a new song or a song first achieving prominence during the eligibility year." However, there is one other key way Swift could win. Because, there was of course one major plot twist in the life and times of Taylor Swift this year: the revelation that she co-wrote the Rihanna hit of the summer "This Is What You Came For." The plot thickens. She wrote it with her former boyfriend Calvin Harris under the pseudonym Nils Sjöberg (a singularly well-chosen pseudonym, sounding like the sort of sneakers n' minimal design bro this writer could imagine Calvin Harris chilling with), and, since it was released on April 29, 2016, it falls well within the time period for being an eligible pick. This means that Swift and Harris would be eligible for the "Song of The Year" category, which rewards the writer/s and composer/s of a track. This also means that it could be the most awkward acceptance speech of our time. But don't fret. Whether or not the talented songstress receives a nomination, you may well still hear from her come Grammy o'clock. According to Hollywood Life, Taylor Swift and Drake are working on a song that they'll perform together at the Grammys. So, even if Swift isn't fortunate enough to receive a nomination this year, we could still be lucky enough to get the Swift-fix we're craving.